Foot pain is common during pregnancy , especially during the third trimester. Since staying physically active is important during pregnancy, consider talking to a foot doctor in Sugar Land about your foot pain. Your foot doctor can evaluate the extent of the swelling and determine if it could be a sign of an underlying complication. When you watch this video, you’ll learn that the lower extremity swelling that occurs during pregnancy is symmetrical. If you notice that one of your calves or feet is more swollen than the other, your doctor may ask you to have an ultrasound to check for blood clots. Sometimes, sudden and significant swelling may indicate preeclampsia, which can also cause headaches, blurry vision, and upper abdominal pain. Both preeclampsia and blood clots are serious medical conditions that require an immediate medical evaluation. 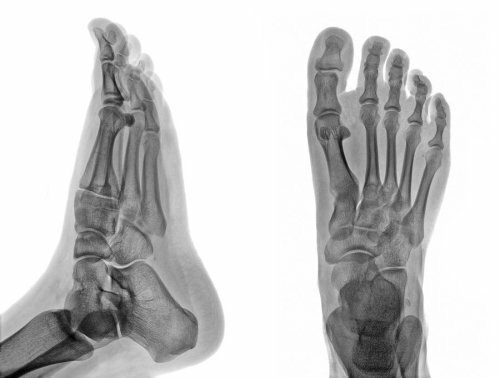 X-rays are an important diagnostic tool for foot doctors . They allow doctors to evaluate a problem and to track the effectiveness of the treatments they are using. Here are some of the reasons your foot doctor in Sugar Land may recommend an X-ray. If your doctor suspects that your foot pain is being caused by a fracture, he or she will order an X-ray to see the bone and look for signs of a crack or break. An X-ray can also tell your foot doctor if the bone has been changed by an infection, arthritis, or another bone disease. If you have suffered an injury, an X-ray lets your foot doctor locate pieces of glass, metal, or other foreign objects that can be lodged in the wound. In some cases, X-rays are used to ensure that children’s bones are growing properly. If you had your foot in a cast, your doctor will perform an X-ray when it is removed to make sure that the bones are fully healed. It’s important to take care of your feet, no matter your age, but there are a few specific aspects of foot care that elderly individuals should be aware of. Talk to your podiatrist in Sugar Land and watch this brief video clip to find out more about keeping your feet healthy as you age. Elderly individuals may have trouble reaching their feet, and so they may require some extra help to keep up with foot care. Thickened, damaged, or ingrown nails are all signs that an elderly person may need extra help from a foot doctor to care for his or her feet. During any podiatrist appointment, it’s important to bring a list of current medications and health conditions, such as diabetes and arthritis, so that the foot doctor can gain a complete picture of the patient’s health. Bunions are lumps of bones and tissues that develop on the outside of the joint as a result of abnormal stress on the joint. Without bunion treatment in Sugar Land , the bunion will continue to grow. Bunions cause the enlargement of the first metatarsal, which is supposed to distribute the weight evenly during movement. Wearing tight, high-heeled shoes can cause bunions. Bunions might become swollen and inflamed, which could lead to pain and trouble walking. Learn more about bunions in this video. If you have a bunion, you should schedule an appointment with a foot specialist to learn about treatment. What Are Good Shoes for Women with Bunions? The need for bunion surgery in Sugar Land often results from wearing shoes that distort the natural shape of the feet. Women in particular are at risk for bunion formation. This video explains how footwear can impact foot health. Many women wear high heels, but this type of shoe can create unnatural pressure on interior side of each foot. As a result, the large toe bends inward toward the rest of the toes, which forces the bones at the base of the toe to protrude. A foot and ankle specialist may caution women who wear high heels to try other forms of footwear that allow the feet to move as they normally would. Shoes with a wide toe box can provide sufficient space and support, which can help in averting bunion surgery. If you regularly choose high heels to complement your outfit, you’re putting yourself at risk of a wide array of health problems. High heels are notorious for causing foot pain, but did you know that your heels can affect practically your whole body? In addition to bunions, ingrown toenails, and neuromas, high heels can lead to back problems and even headaches. This is because they affect the angle of the lumbar and cervical regions of the spine. Watch this video to learn more about the many problems associated with high heel use. This doctor explains how these fashionable shoes cause ankle problems, knee pain, and even eye problems. If you’ve suffered a foot or ankle injury , contact Advanced Foot & Ankle Specialists at (281) 242-3338 and ask us how we can relieve your foot pain. Our podiatry clinic is conveniently located in Sugar Land and Houston. Are Seniors Able to Get Bunion Surgery? Why Does My Podiatrist Want to Remove My Surgical Hardware?